Big fan of Was (Not Was). David Weiss (aka David Was). Don Fagenson (aka Don Was). These guys are the Bizarro World funkenstein frontmen on this ride. 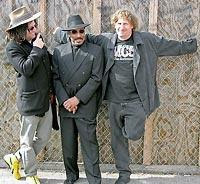 But there are a slew of fantastically bizarre musicians who dribble on and off this court like point guards in the NBA...who help nail this pork pie hat. Looks like John Oates (minus Hall) in this video mix. And I swear one of the three computer geek guys from "The X-Files" show up, too! Lost Gem:-->"Knocked Down, Made Small" (1983)...is a Motown throw-down vocal burn that drives this rock tank more urgently than the lyrics might suggest. On the day that I was born. And his feet are made of clay. He knocked my head against the wall. And you don't get no ice cream. Not even if you scream. Treated like a rubber ball. I drove his car into the river. As they dragged me to the shore. Wouldn't look me in the eye no more. I had my share of hard defeats. I felt the shackles on my feet. I was facing odds that I could never beat. And put my conscience on the shelf. Didn't care about no one else. 'til the victory is won. ever stopped the bullet from a gun." 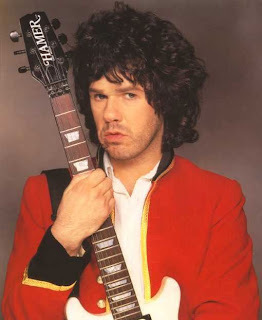 Gary Moore has been unfairly flying under the RnR radar. Hooking up with different bands since the early 70's....along with his continuing killer solo work...I finally climbed on board the GM wagon during his stint with Thin Lizzy. 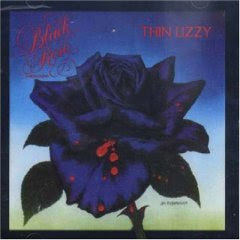 Most notably on the awesome..."Black Rose" (1979). Lately, I've been snacking on some of Moore's solo soup...and highly recommend most of it. The wickedly lost gem..."Out In The Fields"...was released on the blistering "Run For Cover" (1985). Especially choice...Phil Lynott adds guest vocals and some of his throwdown bass that always seems to bring out the best musically in Moore. The video...unfortunately...reeks of that early 80's cheesiness...but fughetabutit...the music is screwdriver tight. Sadly, this is one of the very few recordings made by Phil Lynott before his tragic death on January 4, 1986. Check it out! 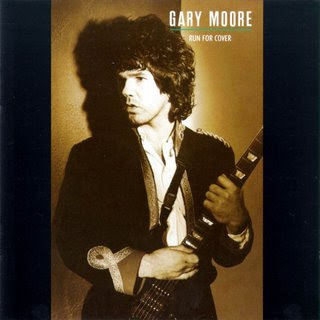 Gary Moore (w Phil Lynott) --"Out In The Fields"
Pick up some Gary Moore.